Win this app April 30 – May 3, 2015! Today I am reviewing 2 apps about numbers. They are titled Ten Fingers + and Up to 100. Both of these apps compliment each other really well. For the past few weeks, I have been trying out these apps with my two little boys and I am really excited to talk about the many exciting features they have. The “hands on” feature in this app is pretty magical. I was excited as an adult to play with it. It is what sets this app apart and makes it unique. The child can touch the screen with 1 finger and the app will repeat, “one”. 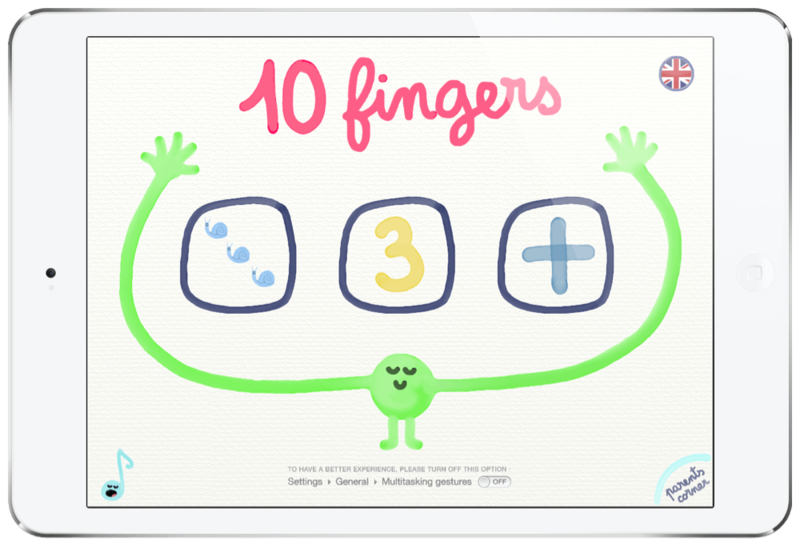 The child can put all 10 of their fingers on the screen, and the app will repeat and identify “ten” right away. It is pretty cool and gives that instant gratification that kids love because you hear the response immediately. Both of the apps reviewed today use this touch learning approach through out all of the activities. You can also purchase the toy that works with the apps. It includes a box of 10 wooden numbers. 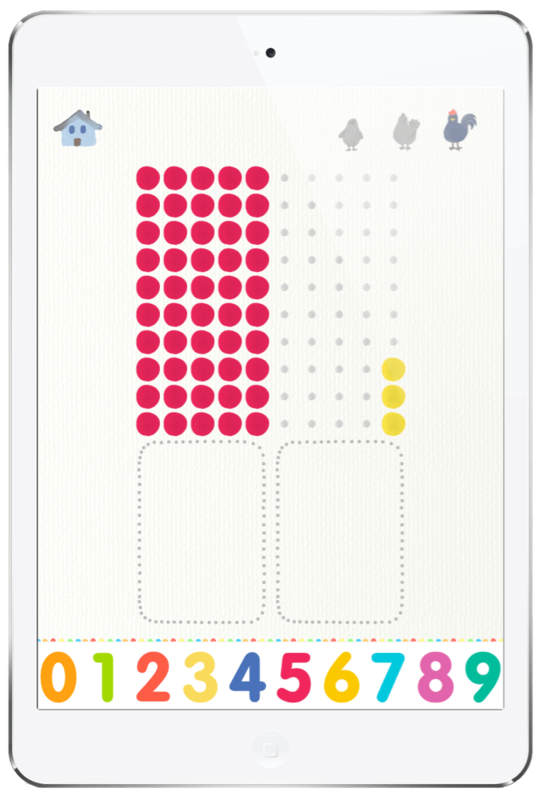 The child can set the “1” puzzle toy on the screen and the app will recognize what number it is. What is also neat is that it will recognize numbers next to each other as one. For example, if you lay a “2” and a “5” together, it will recognize it as “25”. We will discuss in depth both apps but the 10 fingers + app is a great beginner and overall app for toddler and preschool aged children and the Up to 100 app is best suited for kids that know all of their numbers 1-10 but want to expand and know even more. Both of these apps were created by Marbotic. They have strived to create apps that integrate Montessori pedagogy and technology together. “Hands on” activities that increase the exploration of the child can help develop a healthy appetite for learning. Both of these apps are very unique in that they do require more creativity and exploration than other apps that I have tried. My kids were more engaged, and excited about using an object and even their hands to count and create numbers on the iPad. When you enters the apps’ main menu, you will have three options. You can count and explore with objects like snails and turtles and stars. You can identify and match numbers with your fingers or the puzzle toys. Last, you can explore adding numbers together and begin problem solving. All of these options are simple and easy to navigate for even the youngest of children. 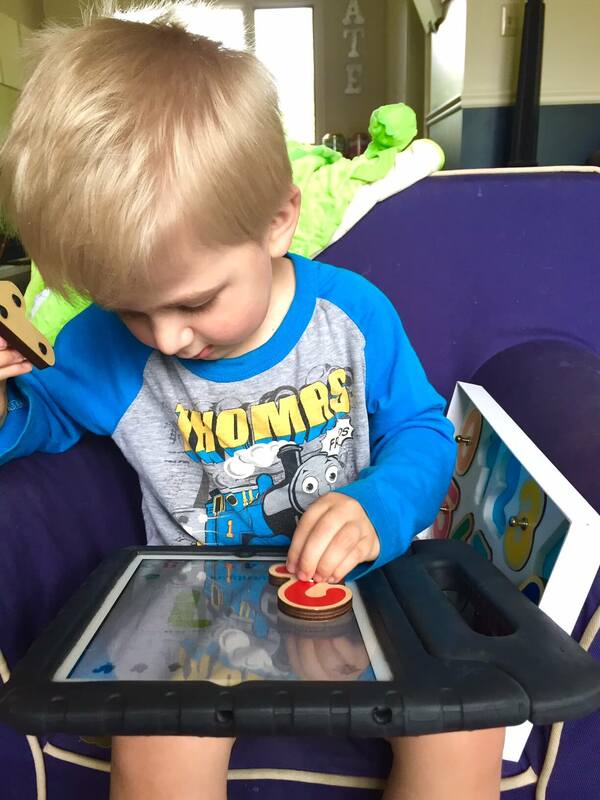 The child can choose to explore and just play with the app or they can complete learning activities. There are levels of difficulty on the top right corner of the screen when doing the learning activities, I kept it on a low to mid level for my 3 year old but all the way at the highest level for my 5 year old. A lot of the time, they enjoyed just exploring and playing with the numbers without rules or guidelines. While the exploration of this app is incredibly neat, if you are wanting your child to work through levels on their own and be working towards goals, this app is probably not the best choice. It has more of a freestyle play vibe. They won’t be passing levels off and there is no data to track or progress to view. You will find a parents corner which gives more insight into the app and how to use it. This can be found on the bottom right corner. Ok so both of my kids loved this app. The sound effects are fun and the app is very well designed. There is a free lite version of this app to try out before purchasing as well. The next app is Up to 100. Up to 100 is a great continuation from the 10 fingers +. It focuses more on big numbers. It also features numbers written out so children can begin to recognize those. It offers different languages for those who are bilingual or entering a bilingual program. Within this app, you will find 2 options. You can combine numbers to create one big number. For example, you can drag a “3” onto the screen in one box and an “8” in the other. It will read as “38”. With that option, the child can be directed to find a certain number as well. The other option is you can count with a bead graph. It helps the child visualize what “50” really means when they can see 50 beads lined up. It helps children start to understand the “1” place and the “10” place as well. There are 3 difficulty levels in the top right corner. You will see a chick, a hen, and a rooster. The chick is the beginner level and really just encourages exploration. The hen and rooster levels will ask for certain numbers and the child will need to produce them by dragging numbers onto the screen, using their fingers, or using the connected number toys. One thing I didn’t like about these apps is that it was in a locked position and so the iPad always has to be vertical to play the game or always horizontal for the 10 fingers app. My kids got a little annoyed with having to move the app and keep it vertical. The setting menu offers a lot of customization. You can turn the colors off for the beads. You can turn the music on or off. You can choose between 2 different fonts for the numbers that are written out. You can also choose the range of numbers to play with. One downside is that there are no parental controls to access the settings. A child can play with the settings as much as they want. There isn’t too much damage they could do however because the settings are so simple. You won’t find any third party advertisements in the app. It is very safe. 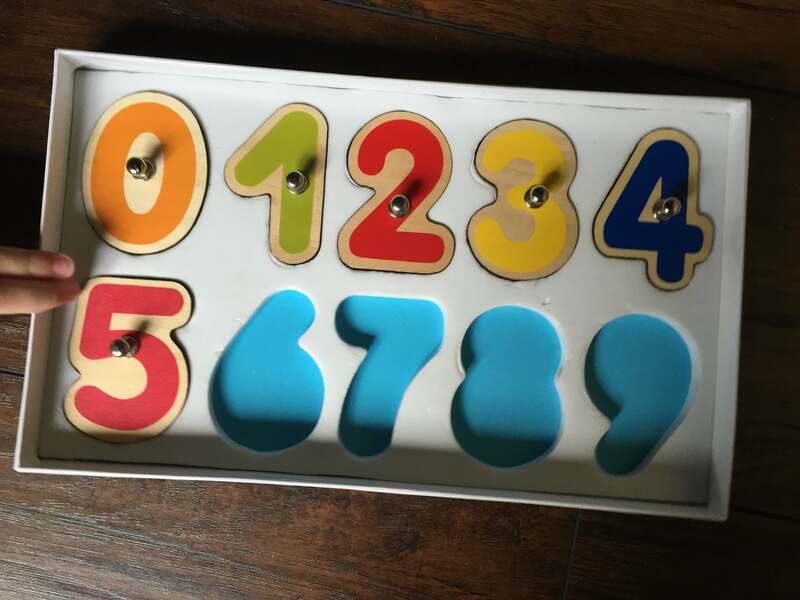 There is a connected set of number toys available on the Marbotic website for purchase that works with the iPad. You can order them and read more by clicking here. My kids thought this was so cool. I have never seen a children’s app that worked with a toy before. We had fun playing with all the numbers and combining them together. They are well made and stored in a nice box. I don’t think purchasing the toy is necessary to play the apps. There are some benefits to not using the toy. Understanding how to count on your fingers is one of those benefits. Overall though, my kids did prefer the number puzzles and they had a lot of fun with them. I would guess they played twice as long with the toy as they did with just their fingers. It is easier to progress with number recognition and with the Up to 100 app if you have the connected puzzle toy set. I would definitely recommend the toy. Overall, I think this app is completely fantastic. I love the hands on approach. 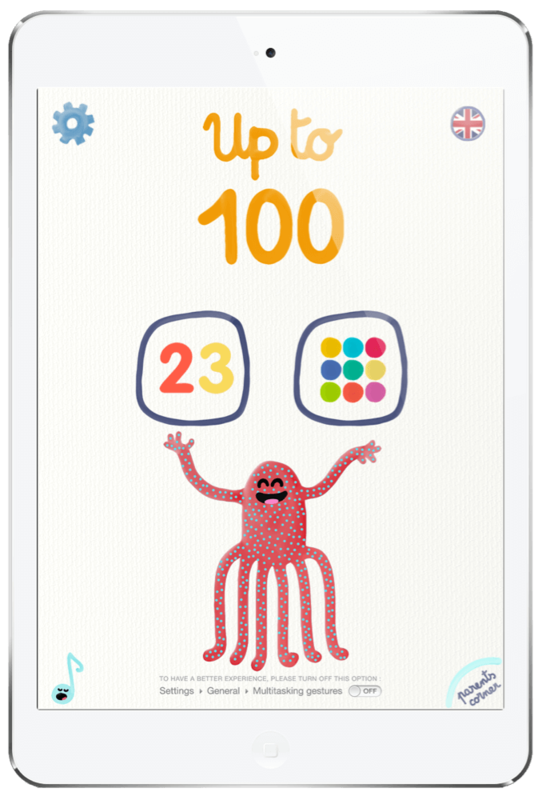 I think children will embrace learning about numbers through the app. Nothing is forced and it feels very natural. The app is designed for kids between the ages of 4-7 but I think it would be great for kids as young as 2. 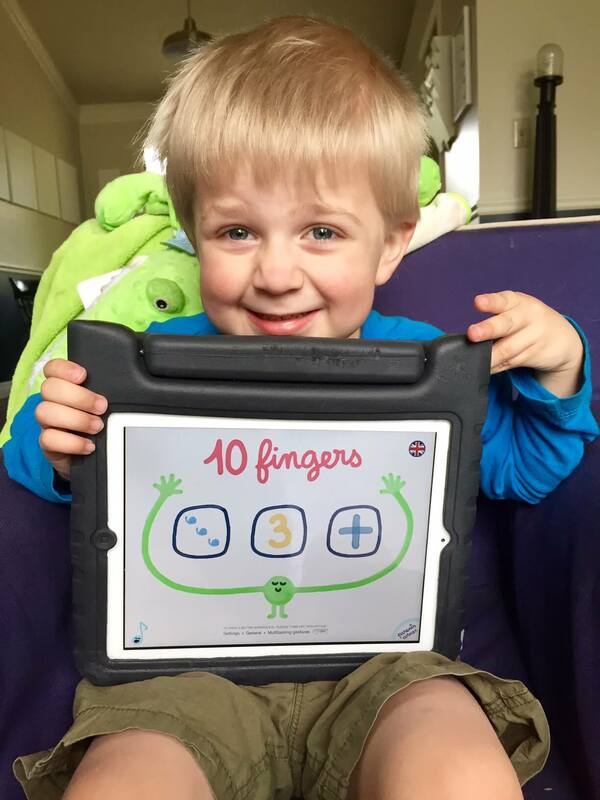 The correlation between counting on fingers and seeing those numbers on the iPad screen helped my 3 year old son understand numbers and counting a lot more. I also think that this app will benefit a lot of children with Autism. Autistic kids tend to be very visual thinkers. They also struggle sometimes with playing with toys but they love technology. This app idea pulls together both of those things and will challenge them in the right way. This is the most unique app I think I have ever worked with and I would love to see more “hands on” apps that integrate toys with technology. The big negative for me is that both of the apps don’t allow the screen to rotate. They are locked. The Up to 100 app is always in a vertical locked position and the 10 fingers + is always in a horizontal position. I would love to see that changed in the future. I also loved the connected number toy set. I think having something tangible to hold and engage with makes a big difference in applying the principles learned into today’s world. With that said, I don’t think that you need the toy to enjoy and learn from the app. I think using your fingers instead of the toy has some benefits as well. Be sure to check out the 10 fingers + and Up to 100 app today! The Marbotic website will help you learn more about Montessori pedagogy and technology. When writing this review, Ten Fingers+ retailed for $1.99 and Up to 100 retailed for $2.99. The app teaches children about numbers, counting, quantity, and the development of fine motor skills.